"So, it looks like we're going to have to skip the snowboarding in Kosovo then?" "Yeah. But we could go through Albania instead..."
September 2009. I'm in South London with Danny; child-hood friend, fellow snowboarder and driver for our forthcoming Balkan snowboarding adventure. Maps are spread across the floor, we have two laptops fired up, and an excel spreadsheet displays on the plasma TV. Several ski guides and snowboard magazines are scattered around the room. We're meticulously planning our Balkan Snowboard Trip - a two week adventure that will take our minibus of eight snowboarders almost 2000km around the former Yugoslavia to sample the snow, ski resorts and cities of Serbia, Macedonia, Montenegro and Bosnia & Herzergovina. Problem is - information about driving in the region is scarce. It's pretty much uncharted territory for the average Brit, and we're struggling to patch together bits and pieces from second-hand accounts, Bosnian websites and the odd ski article. We finally manage to pull a route together but whether things will actually go to plan is another matter. February 2010. A haggard air hostess hands me a white plastic cup and fills it with water. I bite into my meagre, though perfectly edible, red pepper and cheese roll. The Yugoslavian Areo Transport (JAT) plane is hot, stuffy and reeks of smoke, but we're all on board and en route to Belgrade, Serbia, first stop on our Balkan tour. Between us, we've ridden mountains in some far flung locales: Japan, China, New Zealand, Canada, and Kashmir amongst others. The Balkans are only a three hour flight from the UK, but somehow it feels like we're heading more off the beaten path than many of the places we've been before. There remains a strange stigma about Eastern Europe. Many people (including myself to some extent) still have misconceptions about the region. Cities like Sarajevo and Belgrade reignite memories of bombings and bullet holes from the 9 o-clock news; we imagine concrete tower blocks, corrupt officials and dodgy drivers. However, all of these things are required elements for adventure and part of the reason I wanted to explore the area and see through my own goggles, what snowboarding the Balkans would actually be like. 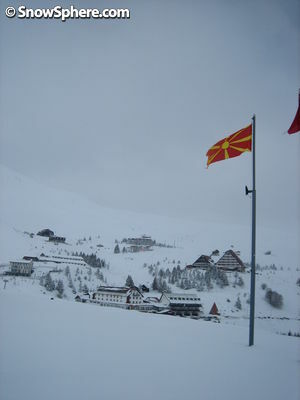 Macedonian military check point; unmaned. The trip begins almost disappointingly smoothly. We land at the surprisingly modern Nikola Tesla Belgrade airport, haggle with some taxi drivers and head to our hotel with snowboards hanging out the back of the car. Later, we pick up our minibus and have some fun fitting eight board bags into the van, but with some Tetris level packing, we eventually get it right and hit the road - first stop Popova Shapka - Macedonia. After negotiating the concrete flyovers and swerving to avoid a pack of stray Belgrade hounds, we're on our way heading south. The motorway is empty, the tarmac smooth, and - as soon as the last Belgrade tower block fades from view - the landscape rural. Haystak upon haystack line the road where muddy villages and handful of houses mark each village we pass. We make steady progress, the tunes are pumping on the stereo, and everyone is excited for what lies ahead. If we'd known about everything that lay ahead, perhaps we would have been a little more apprehensive. The Serbia-Macedonian border crossing goes without incidence. After fearing we might have to unpack the entire van, the stern looking armed guard breaks into a smile when he sees our passports. "Manchester United!" he shouts enthusiastically. "Manchester United!" all eight of us shout back, giving him cheesy grins and the thumbs up. If pretending to be Man U fans will get us through all five of the border crossings that smoothly, then we'll all be trading allegiances for the trip. With passports stamped, we roll onwards. Eight hours after leaving Belgrade, we're winding up the long snow-covered road from the town of Tetovo to Popova Shapka. 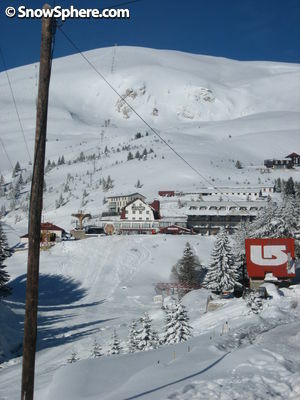 Meaning "Priest's Hat", it's Maceodonia's premiere ski resort and is also the base of Eskimo Freeride - Europe's only cat-skiing operation. 'We have snow' - they sure do. Our route is snow covered, but Danny skilfully keeps the wheels turning as we climb the steep road and we just about make it without having to put on the chains. We finally arrive in the town; a cluster of half-built block houses, communist looking hotels and some new, flashy chalets. It's dead. Snow is whirling around us and we can't find our hotel. 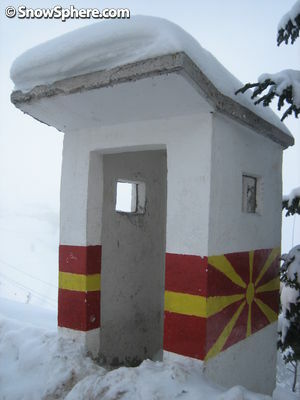 We pass a military sentry box with a Macedonian flag painted on the side. But there's no-one keeping watch over the mountains tonight. A man walks towards us with a drunken sway. I jump out to get directions. "Zdravo. Gdje je Hotel Granit?" I say, greeting him and asking the way with words memorised from the Lonely Planet guide. The name of the hotel elicits some recognition in his inebriated eyes. He points down the mountain, over a steep drop. "Hvala" - thanks, I reply and hop back in the van. We drive on, but reach a dead end and can't find the road. After driving around for another puzzled ten minutes I jump out again to ask a bunch of snowboarders standing outside the only shop in town, a small, caged room with bottles of unfamiliar drinks and snacks. I greet them in Macedonian but they reply in near perfect English. They are Croatians and are staying at the same place, so kindly lead us to Hotel Granit - a hostel style lodge, right on the side of the piste. We drag our gear down the snow covered path and finally reach our destination. It's obviously the hangout for the cool kids in town; on the roof there's a giant Burton logo, dub-techno plays on the sound-system, the scent of stone-baked pizza wafts from the kitchen and everyone is friendly and relaxed. They're especially happy to welcome our group - we're their first ever British guests - they explain. We unload our gear into the rather small, though adequate bunk rooms and crack open eight bottles of Skopsko - the local Macedonian beer. "Na zdravje! - cheers!" We toast to our first day on the road. 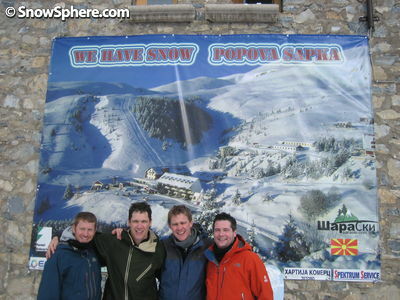 We've made it on one piece, and tomorrow is our first taste of Balkan Snowboarding. We tingle with anticipation as we look out onto the cold, silent Shar Planina mountains that loom 1780m high, before retiring in a happy, drunken haze. After a continental style breakfast of bread and cheese, we gear up and head out. It's snowing lightly as we strap-in on the deck of Hotel Granit and ride down to a small slope-side kiosk to get our tickets. It's possible to buy a single run here, but we opt for a day pass. Popova Shapka is definitely of the 'old school' ilk of ski resorts. The collection of six lifts are largely aging t-bars or infuriatingly slow chairs. But the terrain offers promise. 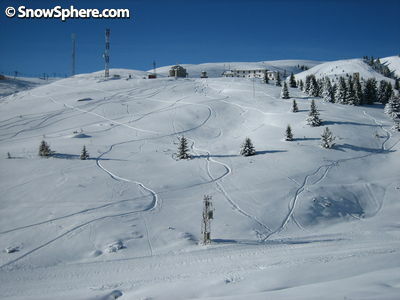 There are a few groomed runs that sit next to the lifts, but there is no marked piste. Indeed there is a gaping hole in the middle of one run where a stream runs below providing a genuine hazard to the unwary. But no warning poles mark the danger. It's a reminder that we're not in the mollycoddled West anymore; here you look out for yourself. The slopes are almost empty. The handful of skiers (who all seem to be Albanian judging by the flags they are proudly flying) seem happy to ski (badly) down the groomers, leaving the rest of the terrain for us. The mountain is very open - there are almost no trees, and much of the powder has a crust, but we eventually find a little piece of Macedonian heaven; a gully with pines that have protected the snow and preserved the powder. A small mountainside church watches over us as we spend the rest of the day lapping the area, dodging trees and throwing up a spray. 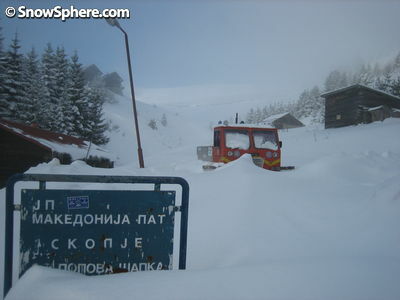 If you come to Popova Shapka, don't expect too much from the on-slope facilities. 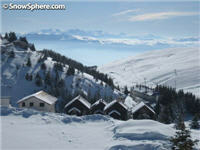 They are basic, and attitudes to skiing, snow and the slopes are different to what we're used to in Western Europe. The only on-slope toilet is a Portacabin with no running water, or indeed, toilets. People have left their business in little piles all over the floor instead. 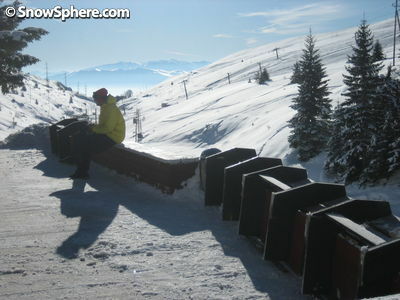 At the base of the slopes, a group of kids are having riotous fun, firing past on wooden toboggans. But when they leave, the slope is carpeted in plastic bottles and crisp packets. Indeed, all day we've been saddened by the amount of litter on the slopes. Litter bins don't seem to feature in the vocabulary here. It's been a good day, and as the sun sinks below the Macedonian mountain peaks, we retire on the sun deck of Hotel Granit to enjoy the last of the rays. We spend the rest of evening in the bar chatting to the staff and the only other guests, our Croatian friends. They all speak excellent English and the Skopsko beer assists the international banter. "Try this!" says Hristina our host, handing us shots of a clear liquid poured from a plastic bottle. One sniff confirms it's not water. "This is our national drink - Rakija - everyone makes it. We made this in our bedroom". The fiery spirit burns on its way down, but it's a fitting end to our first day snowboarding in Macedonia and indeed, the Balkans. The friendliness of the people we've met is every bit as warming as their bedroom-brewed drink. After several more doses, it's time to retire. We've got an early start tomorrow sampling Europe's only cat-ski operation, and if the weather holds - we're in for a real treat. We flew from London Heathrow to Belgrade with JAT - we found our flights using Skyscanner to see when was cheapest to fly.